Many of today’s health problems can be traced to poor diet, so it stands to reason that people who grow their own food should be happier and healthier. A school garden is a great way to get kids involved from an early age, so they develop an understanding of where fresh food comes from and an appreciation of just how delicious it can be. School gardens offer children the chance to get involved in growing food – a skill that will last them a lifetime. They’re a great teaching resource too, with many opportunities to link into the school curriculum. The most important advice is to start small. Containers and larger planters are very manageable and you can grow just about anything in them. Containers allow you to create an almost immediate impact, anywhere, at minimal cost. Raised beds are excellent because they clearly delineate the growing areas, making it less likely that precious seedlings will be accidentally trampled. Place them directly onto soil, or first lay down a membrane if you’re growing on contaminated soil or a hard surface such as a concrete yard. Fill the beds with nutrient-rich potting soil and compost. Beds shouldn’t be any wider than 3ft (90cm) across, so the children can easily reach the middle of the beds from the sides. Wood chippings are a good choice for the paths in between, being relatively clean and soft. If your garden is going to be a little more ambitious, then why not get the kids involved in the design process? Ask them to make sketches or put together a mood board of what they’d like to see. They could even make their own design on a computer. Our online Garden Planner is child’s play to use. Drop in Garden Objects such as paths, raised beds, compost bins and bean wigwams, then have fun adding the plants. Clicking on the ‘i’ Information button next to each plant brings up growing tips along with suggestions for suitable companions to grow nearby. Children are far more likely to eat fruits and vegetables they’ve grown themselves – a great reason to get them involved in the process! Choose crops that are robust, easy to grow and - crucially - ready to harvest during term time. Peas and beans. 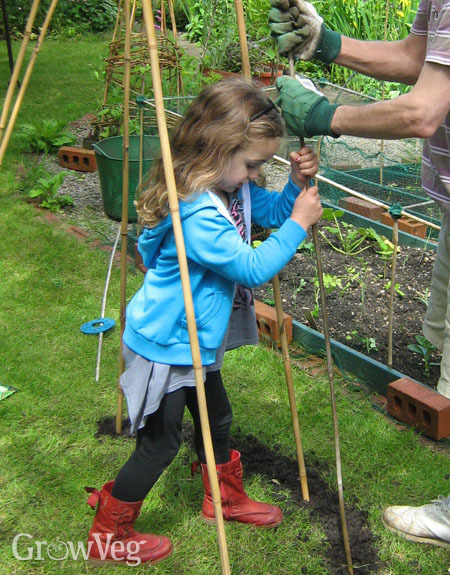 Children love sowing the fat seeds, setting up supports and, of course, picking the pods. Potatoes are fun to sprout before planting into potato sacks or beds. Kids will love the hands-on growing process and unearthing the potatoes – nature’s very own treasure hunt! Winter squash and pumpkins can be planted out at the end of spring and will be nearing maturity when the children return from their summer break. How about a pumpkin-carving competition? Salad crops such as lettuce leaves and radishes are quick growing and will keep youngsters engaged. They’re also perfect for growing in pots to take home. Kid-friendly fruits include strawberries in raised beds and planters, plus all manner of fruit trees for an autumn harvest. Flowers help to attract bees, butterflies and other wildlife into the garden. Children will love the splash of colour they give too. Annual flowers are quick growing and should start blooming before the summer break – think calendula, nasturtiums, zinnias and more. Don’t forget herbs, many of which have beautiful, bee-friendly flowers. The Garden Planner is a great tool for choosing school garden-friendly plants. Simply click on the Custom Filter button then select the ‘Easy to Grow’ option to narrow down your selection. You can also use the Sow, Plant or Harvest filters to select crops that can be grown and harvested during the months the children will be at school. Click OK and the plant selection bar will be filtered accordingly, making the decision making a lot simpler. School gardens can teach children the importance of caring for the environment and how nature works to feed us. Include a compost bin in your plan to show how old plants turn back into lovely, nutrient rich organic matter to feed the soil. A rainwater barrel will demonstrate how to collect and make the most of precious water. Bug hotels and miniature ponds will draw in even more wildlife to study and admire. Make sure there’s somewhere to sit during break times or outdoor lessons, in the shade or sun, depending on your climate. Potting benches or tables are useful if you want to sow or plant up pots outside of the classroom. And, of course, you’ll need a shed for storing your tools and equipment. 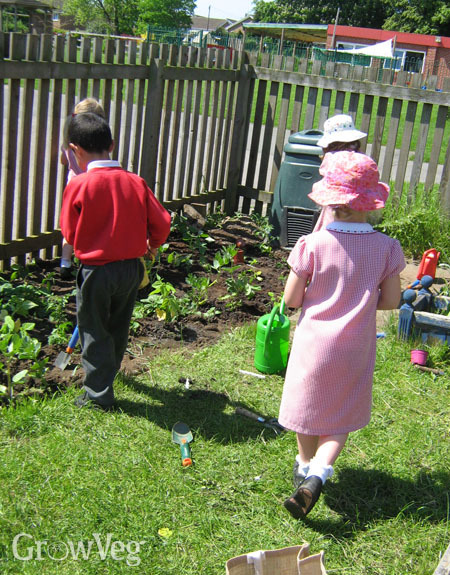 School gardens can be more complicated to look after than a home garden. Make it clear from the start who is responsible for what. Who will water the garden in dry weather? How will you order new seeds and potting soil? And what about when everyone’s off for the holidays? Starting small and getting systems in place from the beginning will build a strong foundation for a successful garden. Teach the little ones to grow and they’ll grow up with a healthier attitude to food and an innate love for wildlife and the outdoors. If you run a school garden we’d love to hear from you – please share your advice and experiences in the comments section below.